Hey guys, I took a short break from writing pre://d.o.mai.n to do a little previsualization exercise-I designed mock up covers for each of the five books in the d.o.mai.n series. I also wanted to talk about my plans for this series as well. I have four stories outlined for this series-as of right now. there may end up being another book or two added at a later date, but I will see if the story is big enough to accommodate them. Another possible determining factor in which order that these books get written is that I plan to shop them (or at least the first one, for starters) to agents and publishers. 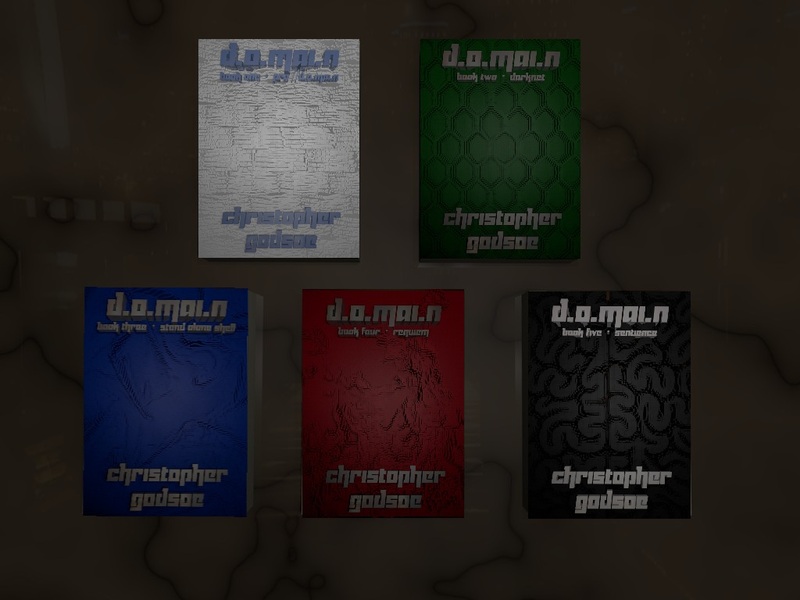 I tried out independent publishing on my first book, and it seems only fair that I give traditional publishing a shot at this series. Plus, I am an absolutely awful promoter, so I would rather have someone else giving me a little bit of a hand with some of that as well. I have huge hopes for this series, and I would like to give it every chance to reach as wide an audience as possible. So once the first novel is done, I will shop it to agents, and hopefully it will get picked up by someone with an abundance of enthusiasm for my vision. In my dream world they would want to hear about my plans for the rest of the series, and a decade down the road someone would want the movie rights (or sooner, I think that would be okay as well, lol), because I can see this series having "summer blockbuster cash cow" written all over it....but what can I say, I'm a bit biased. If they do not get picked up by an agent/publisher, they will be self-published. I have far too much invested in this story to hide it in a foot locker because a few industry types can't see the good in what I have created. So either way, you will all be getting the opportunity to check these out in the future. As always, let me know what you think in the comments below, or ask whatever questions you may have as well.